If you’re still not convinced about the power of visual content, you should just have a look around and see which social networks are booming right now: Instagram, Pinterest, Vine. Want some more proof? 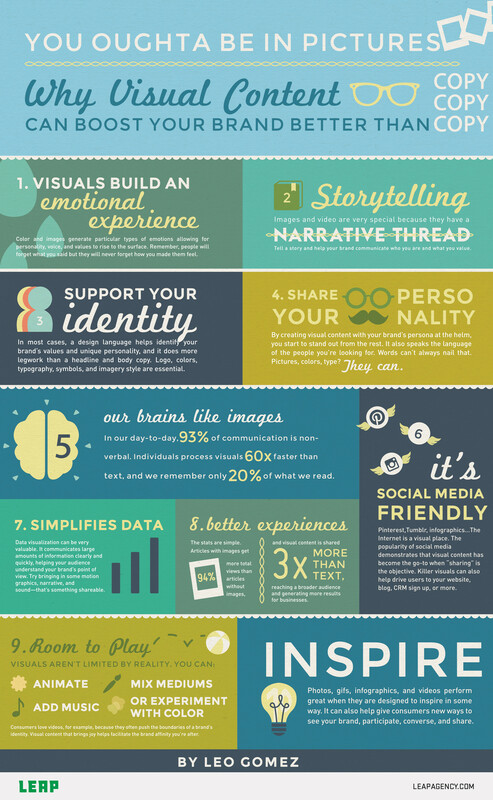 Leap Agency have put together a useful infographic with the top 10 reason why you should turn to producing visually enticing content for your audience. – People remember feelings and images are a perfect way to trigger emotions. – Images can be easily combined with the brand palette and logo in order to have a greater impact and help people associate a picture with your brand. – An image is processed 60x faster than words and our day-to-day communication is 93% non-verbal. Amazing. – Social media have become a visual playground. Why not be part of the fun? Tired Of Static and Flat Visuals On Facebook?